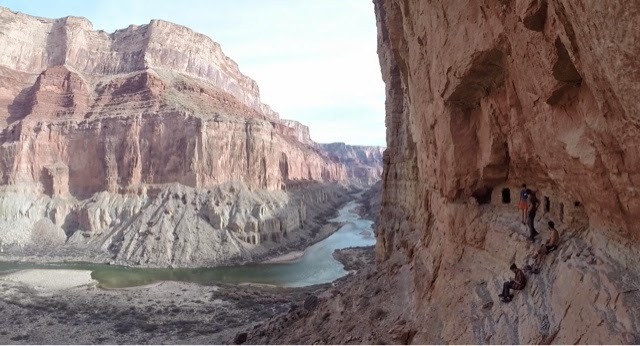 A DIRTBAG DOES THE BIG DITCH - Peter Ely's journal of his 2015 Grand Canyon mission PART ONE. 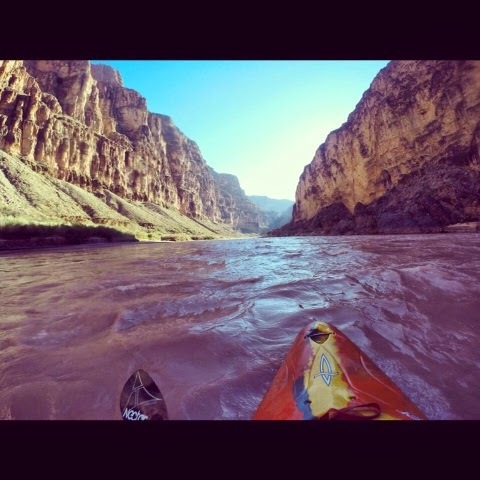 By Peter Ely | DBP MAGAZINE ONLINE The World's Best Free Whitewater Publication. 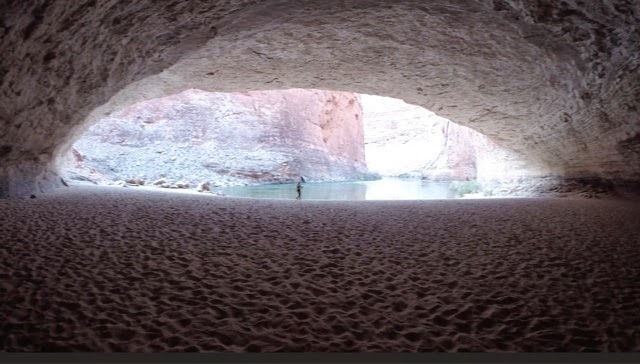 Editors: Kayaker Peter Ely, a transplanted Californian who makes his home in the mountains of North Carolina, recently completed a mission down the Colorado River in pursuit of the ultimate Good Livin’. He shares his journal entries with us in this series, which will run every Tuesday as we travel 20 days with him. ENJOY!! The day has finally come! We are up before dawn and start doing our last minute packing along with making breakfast. After the chaos settles, I grab my food and head out back to watch the sunrise up the canyon wall and top out the rim. It’s beautiful here, hard to believe that this is my home for the next 3 weeks. After having some alone time out back I hear the bus pulling in, so I head back and gather my gear and send out a couple phone calls to the ones I left. We get to the put in and do a little bush whacking to get to our boats that are rigged and stashed just down stream of the put in the night before. When I sit down in my boat and shove off that sandy beach, it is a remarkably freeing feeling. Finally it hits me. I’m in the canyon. No stress of the real world, just you, your boat, and the walls that surround you. I struggle to find the words to express how that feels. I suppose its just something you will have to experience for yourself. After being on the river for all of 20 minutes, a Bald Eagle starts flying over head and following us down stream. Landing here and there to stick out his chest, too far up the wall to get a good photo. I decide that this is a good omen and keep paddling, but little do we know that the bird would follow us for the next 8 days. First few miles and rapids fly by, and Badger proves to be an exciting time as we all start to realize what lays ahead for us. These aren’t the steep creeks us South Eastern boaters are used to. It’s time to beater the big water! Turns out, Ehud is a dirty big water boater and he makes that very clear with a massiveeee kick flip over the wave in Brown’s Rifle; this wave stands roughly 15-18 feet tall. We keep pushing till we make it to House Rock (mile 18) and call it quits. It takes all of 10 minutes of having my Watershed dry bag open before I spot two mice in there just having their way with my belongings. Great, that’s just what I was hoping for, but lesson learned. Seal your bags the second you’re done with them. Camp is set! It takes us a minute to get used to the new gear, but the kitchen crew is cooking, the fire pan is lit, and the groover is pointing straight down Rider Canyon. I certainly don’t hate it here. I keep laughing to myself that this is my life for three weeks. Hard to believe you can be so lucky. The Roaring 20’s!!! Stoke is high on the day. After a late start getting on the water due to maximum jangling… Its going to take a few days to dial in loading these boats and breaking down camp. But we finally put on the water just after noon. And after dropping the first rapid in the 20’s, the miles just start to melt away. We cover 17 miles in practically no time at all. I even decide to ignore all desire for the comfort of my 2014 Dagger Nomad 8.5, which if you haven’t sat in one, feels like paddling a lazyboy downstream. But instead I ditch my shoes and squeeze into the Wavesport Big EZ, a classic, which is just down right painful. But damn, it’s a fun boat. Sadly Vasey’s Paradise is barley a trickle, The group in front of us reports that the whole thing had been frozen up, which would have been amazing to see. But I guess thats a good sign that the weather is warming, and hopefully will continue to treat us good. We make it to Redwall Caverns and have a relaxing game of frisbee. I could stay here for days, so beautiful! It’s a shame that camping is strictly prohibited. Finally we drag ourselves back to our boats and paddle another mile to camp, Little Redwall. After a full meal and a few rounds of some Chinese game that Dan keeps in a bamboo tube… Its time to roll out the good ol’ paco pad, and check for scorpions. Ranger Rick warned us “they aren’t much of spooners, more like forkers” …thanks for the heads up. An awesome start to the day with some hardy breakfast burritos and stout coffee from the home land (expresso news). This eagle is still following us! Either that or there is just an abundance of eagles in the canyon and we have been lucky to see multiples everyday. We spot a couple coyotes on a sand bar and wound up getting into a screaming match with them. I think they won. Not far after we pull over for a lovely lunch at Buck Farm Canyon and have our first side hike up Buck Farm (mile 41). Buck Farm does not disappoint; it is a whole different breed of beauty here, from the tribs and side canyons, to the grandest of all the canyons. It’s only day three and I’m dreading the day I have to leave – it’s that kind of beauty. Don’t know that you could ever have enough time in the canyon. So on day #0 Ehud had introduced us to a new game, he calls this game “what the chance.” You play by proposing something that you know the other person would much rather not do. For instance, I would say “Ehud, what the chance you jump in the river without your drysuit on?” and he would say “1 to 4 chance” (that is, if he’s feeling lucky), and on the count of 3 we would both say a number between 1 and 4, and if its the same number… you lace the hell up and do it right then. Today I finally lost a game of “what the chance”. I was what the chanced that I fill my drysuit to the max with air and float the next rapid… and when I saw Jack getting a good kick out of my loss, I what the chanced him to join me, and he also lost. So we both puffed up to human blobs and waddled off the raft, just in time for President Harding Rapid. A Class 4, granted that is on the scale of 1-10; for some reason all the rapids in here are not the usual 1-5 scale but a 1-10. We take camp shortly after the bobbing, at Eminence. Highly recommended. Eminence is one of my favorite camps of the trip. Unbelievably beautiful, super spacey and convenient. If you’re planning your own trip, make sure to highlight this one in your guide book. It’s my turn in the kitchen, and I kill it with some serious pork chops. Bada Bing, Bada Boom! Damn good day. The most excellent start to the day! I wake up a little before 6 to cook breakfast for the group, and make coffee. After my prep is finished I snag a cup of joe and a camp chair and walk down to the beach to put my feet up and watch the sun rise up the wall and turn the corner. You just can’t beat an early morning at Eminence. We’re on the water shortly after breakfast, and crush a 10 mile flat water stretch in just under 2 hours. We pull over at Nankoweap for a lunch over. We half way set up camp and drop our dry gear for a short but steep hike up to the graineries left behind by the Native Americans that once flourished here. The view from the top is one of the finest in the canyon. It is unbelievable. Another one to make sure you highlight. After the hike there is a lot of laying around and relaxing. Its nice to finally have a little down time. 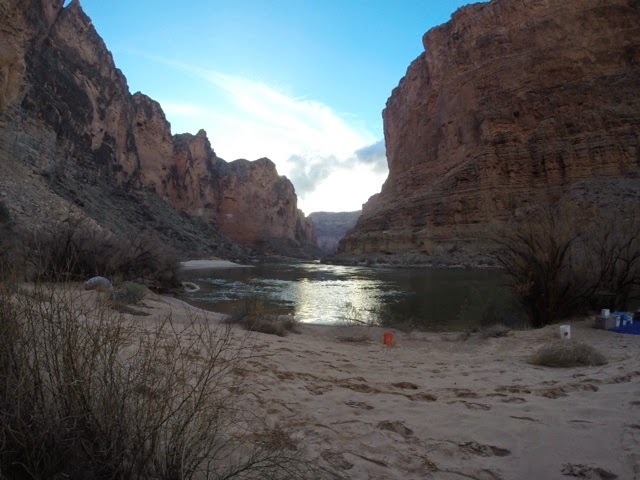 We pack up camp early at main Nankoweap camp, and set out for the Little Colorado river. 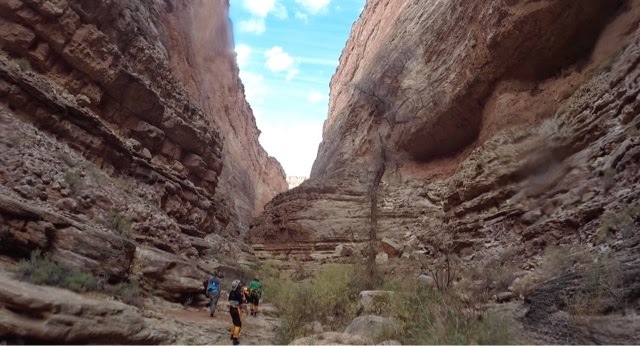 The LCR is known for its beautiful blue and turquoise water flowing into the canyon. Sadly, it’s a thick, milky, brown… But you can’t have it all. We enjoy a solid hike up the canyon a ways, followed by lunch. See several smaller stalagtights hanging on river left of the LCR. First time seeing formation like this in the canyon. After lunch we pack up and head another 4 miles downstream to Lava Canyon. But as we pass by Carbon Canyon we leave one of the 18ft rigs behind for our shuttle back. After we throw up camp we hike up Lava Canyon, and scramble down another canyon to get over to Carbon Canyon, and then hike Carbon out to the Colorado where we had stashed our raft. 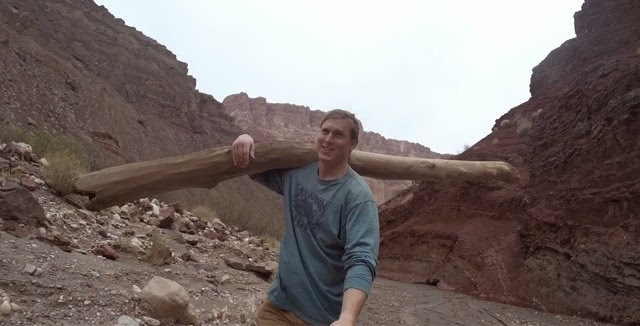 Sadly, as we are hiking up to Lava, Ehud hits me with “what the chance you carry this log all the way to the raft?” Turns out I’m not so good at this game and me and this log, roughly 7 feet long and nearly a foot wide, well let’s just say we get to know each other. I sling this damn thing over my shoulder up and down these canyons on some not so log friendly terrain for 6 miles. This is not my favorite bet and not exactly how I pictured myself spending my first vacation day. But regardless of the challenge, the stoke remains high, because tomorrow we have our biggest day yet and possibly the biggest one of the trip! The plan is to push 22 miles with no shortage of major rapids along the way. Including but not limited to Crystal!! CAN’T WAIT! See you next Tuesday with Part 2.